It is time, once again, for me to parade my intense and undying love for Kenneth Branagh. This time though I'm going to try and frame it constructively in the form of a theatre review. 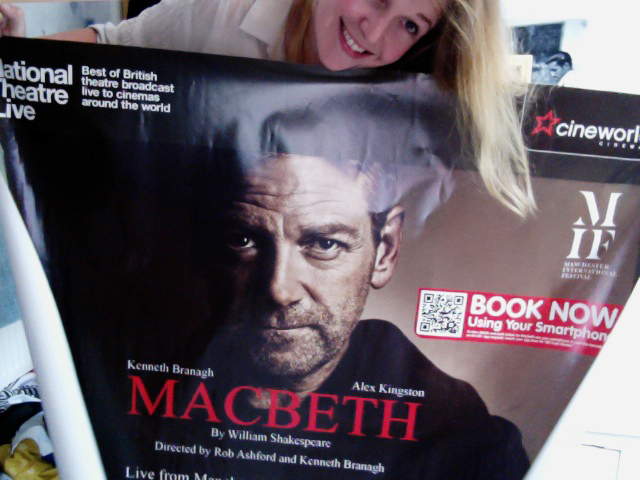 Perks of working at a cinema: giant posters of Kenneth Branagh's face! When the tickets for Macbeth went on sale I was dutifully sat at my computer with enough tabs open to incite RSI. 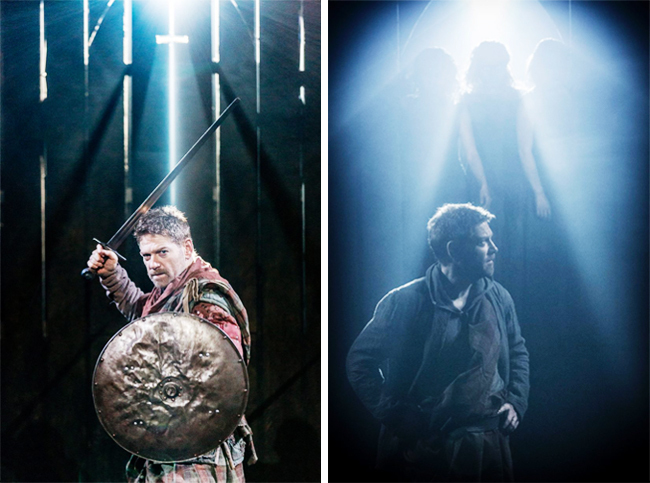 One tab for every possible performance of Macbeth taking place in Manchester at £65 a seat. Hopes of seeing my hero in his first Shakespeare stage performance in a decade were dashed; tickets sold out in 9 minutes and I didn't have a single one. 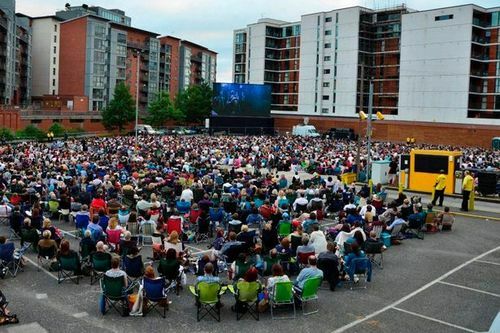 As soon as the screen relay was announced I got tickets for myself and a friend that was also willing to sit in a car park for the chance to see Ken in Macbeth. From the opening of the show I was keeping track of all the news & reviews on my blog, simply rejoicing in all of the 4 & 5 star reviews the show was getting. I was accompanied on my fortuitous theatre journey by another ardent Branagh-fan, which meant that my uncontrollable excitement was a little more socially acceptable. Alas I know little about theatre (though I do wish I knew more), and my motivations in seeing this play were primarily Branagh-based, but I will try and do as much justice to the piece as possible. There was a subtle intrigue around the location of the play which set up the show as a significant event. 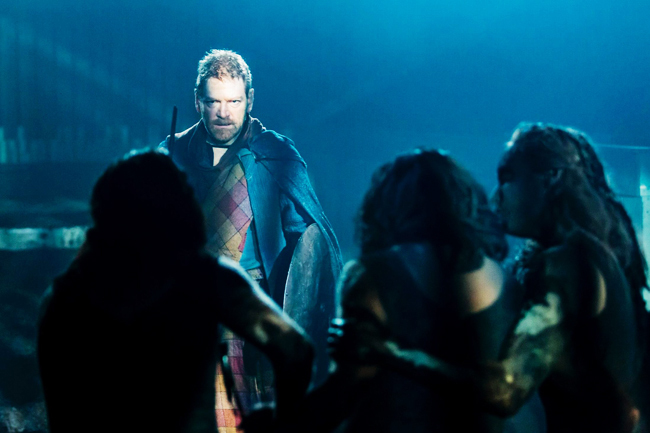 You weren't just going to see a play, you were going to experience it; which may be the most appropriate word for viewing Macbeth. Seated on hard wooden benches in a dark church illuminated at the apsidal end by a thousand candles; whispering and mumbled excited voices. There was no curtain to be seen, just stone and wood and mud. Alex Kingston's Lady Macbeth silently lights candles and prays, yet there is no definite start to the play. It just happens to you. A fierce battle scene below rain and above sodden mud immediately whisks the 200-person audience into the midst of battle. The smell of earth, the sound of rain and the alien panoramic staging required no forced comprehension other than the pre-existing condition of being human. Despite not having much knowledge of theatre, I can definitely attest to the benefits of feeling submerged in action and sensations. Branagh's presence was first formidable; then foreboding, perfectly enhanced and accompanied by the symbolic use of natural and un-natural light within the church space. In his blackest hours the audience are consumed by darkness and sweltering heat; in moments of joy, exposed to some luxurious sunlight. Battle-ready Macbeth descends into a mind dis-eased rapidly but naturally, as does Lady Macbeth. There is never a moment where the audience is uncertain about their emotional turmoil, but instead they comprehend its minutia in the performances of Branagh and Kingston. Performance photographs by Yohan Persson. This is best illustrated by one moment most visible on the big screen relay. A detail invisible to the audience present. The knowledge of Lady Macbeth's death hit Macbeth square in the gut. He's bent double, fruitlessly clutching at his own body, attempting to force words through his lips that will not come. Branagh dripping with sweat and saliva tries to express his rage and anguish. However, it was the sight of one single tear falling from his cheek into the battle-blood-stained earth beneath him that captured the breath of the 5,000 participants in the screen relay (& I'm sure of all those watching in cinema screens across the country). Branagh at his bare, emotional best, bringing thousands of people together under a tiny 200-person capacity roof. This is what he does, after all. He brings Shakespeare to audiences of incomprehensible sizes. 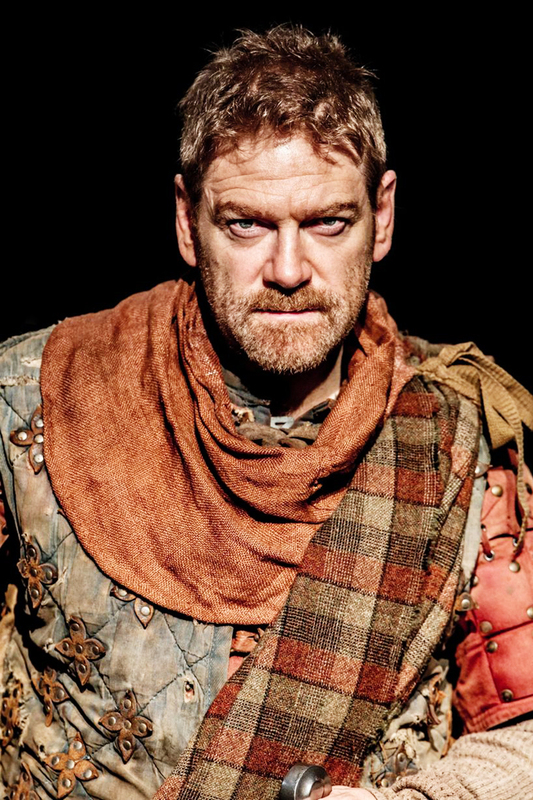 MIFMacbeth has been a huge renaissance in Kenneth Branagh's career, especially to those that follow it closely. He's not a man easily frightened by a challenge, or deterred from his dreams by the past or possibilities of failure. He seized upon Macbeth with all the trademark ferociousness that made his name in the early nineties, but now he's a little older people seem more willing to embrace his work and proclaim themselves in enjoyment of it. It would seem that MIFMacbeth has at least put temporary rest to the Branagh-bashing trend that has existed in small currents and tidal waves since 1989. I, for one, am glad that people are finally giving themselves over to The Power of Ken Branagh.